First Flight Cover for inauguration of first passenger air services by Wearne's Air Service. In my opinion, this is a privately issued cover which is different than the one issued by WAS. This is a special commemorative as it marks historical point the country and for being the first batch of mail being transferred by WAS during its first flight. The cover has no content and the original seal has never been opened. Cover dimension: 163 x 92 mm. 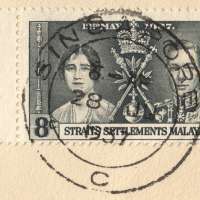 One stamp with 8 cents tied with one CDS cancellation. Coronation Issue: King George VI and Queen Elizabeth. 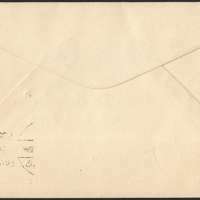 Omninus issued on 12 May 1937. Engraved and printed by Thomas De La Rue. 28 June 1937, time is unknown (too faint to read). 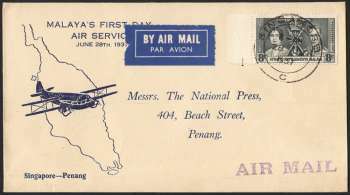 Scheduled air passenger and mail services in Malaya commenced in 1937 when Wearne's Air Service (WAS) commenced operating services between Singapore, Kuala Lumpur and Penang operated by Wearne Brothers Limited. Wearne's Air Service was started by two Australian brothers, Theodore and Charles Wearnes. The service commenced as a thrice weekly flight between Singapore and Penang The first flight, using an 8-seater de Havilland DH.89A Dragon Rapide equipped with twin engines named Governor Raffles took place on 28 June 1937. This inaugural flight departed Singapore from the then brand-new Kallang Airport which had just opened earlier in the same month on 12 June. The new service brought Singapore within 1½ hours of Kuala Lumpur and 3¼ hours of Penang. It ran on Mondays, Wednesdays and Saturdays, returning the same day. Later a second D.H.89A named Governor Fullerton enabled the expansion to daily services as well as the addition of Ipoh as a destination. They normally had accomodation for 10 passengers but the local planes were fitted with only five seats for comfort. Their trim lines were accentuated by aluminium paint, picked out in blue. The tails were blue and dark yellow. The pilot of the first machine placed in service was Flight-Lieutenant Pugh, of England, who had been doing commercial flying with British Airways for two years on a night service between England and Germany. The WAS services was taken over by the military before the fall of Singapore and ceased with the onset of the Second World War Japanese occupation of Malaya and Singapore. The operation was discontinued even after the war. Work on this massive reclamation task began in 1932. Kallang Airport was officially opened by the Governor of the Straits Settlements, Sir Thomas Shenton, on 12 June 1937. It was praised as the finest airport in the British Empire. Regional aviation continue to expand, with the launch of the first internal air service in Malaya, Wearne’s Air Service, on 28 June 1937, which flew three times a week from Singapore to Kuala Lumpur and Penang. In 1937, 32 tonnes of mail was handled at the Kallang Airport. LAST week Mr. Rodney Beresford, late of Jersey Airways and now a pilot with Wearnes Air Services of Singapore, took delivery of a D.H. 86 which has been sold by Jerseys to Wearnes. The machine will be remembered by travelers on the Jersey route as Giffard Bay and has now been rechristened Governor Murchison before going on to the Penang-Singapore run. During its overhaul the machine was fitted with metal airscrews and Marconi radio with direction-finding equipment. The work, which included the removal of two back seats and the provision of a toilet compartment, was done by Jersey Airways at Jersey Airport. Another 86, which has been supplied by Airwork, will be flown out by Flt. Lt. John Pugh, who is the chief pilot of the Company. Page 15, FLIGHT issue 7 July 1938. Born and educated in Western Australia, Mr Wearne left Fremantle at the age of 14 years, and came to Singapore in January 1893 to serve a five-year apprenticeship with the New Harbour Dock Co. Ltd. After gaining his second engineer's ticket in Singapore in 1900. Mr Wearne served for a time on the Australian run, and later on a ship engaged in the Singapore-Penang-Delhi trade. In 1902, he went to England and the following year, at the age of 25, qualified as an extra first class engineer. Back again in Singapore, he left the sea to become assistant to Mr D.D. Mackie, consulting engineer. He left the position in 1904 and joined Mr W. Palliser, a civil engineer and contractor. They constructed the first tramway bridge over the Kallang River and afterwards erected the steel work at the old tramways power station in Mackenzie Road, and the steel frame of the Hotel de L'Europe. Mr Wearne bought one of the first cars used in Singapore, which was an 8 h.p. Oldsmobile with a single-cylinder horizontal engine, and tiller steering. At that time a driver's licence was not necessary but when licences were introduced, Mr Wearne obtained one of the first, and taught the Chief Police Officer, a Mr Cuscaden, to drive. Soon after his retirement, the Wearne brothers built the auxiliary ketch Black Swan, to the design of Sir Charles Nicholson, the eminent British designer of the famous America's Cup challengers, Endeavour I and II. Black Swan was a fine ocean-going craft with a length of 29.8 metres, equipped with a wireless telephone. With a Malay bosun and a Malay crew of six, Black Swan sailed from Singapore for Freemantle in May 1927 under the burgee of the Royal Singapore Yatch Club. She reached Freemantle after a voyage of four weeks and left later for England via the Cape of Good Hope. In August 1928, Black Swan was at Cowes Regatta occupying a berth of honour between King George V's yatch Britannia, and His Majesty' steam yatchs Victoria and Albert. The visitors had a splendid view of racing in which the King, an enthusiastic helmsman, took part. The Wearnes left the Black Swan in England after Cowes, and eventually sold her to a French court, as she was too big for use in Singapore. Mr Wearne resigned from the board of directors of Wearne Brothers Ltd. in 1954, and left the Colony to take up permanent residence in South Africa. It was 61 years since he first arrived in Singapore.